Published February 5, 2017 by Dierdre W.
Did you make a resolution for the new year? Are you sticking to it? Here’s a question that’s always puzzled me: Why wait for January? Every day is the start of a new year! None of us is guaranteed another year on this planet. Or even another day. I make resolutions all year long. I call them goals. If you want to accomplish something, plan it into your life. Now! Make it a concrete goal, today, with tiny baby-steps that will get you closer and closer. Take writing, for example. Writing a book – doesn’t that sound atrocious?! A whole book?! Never! But…do you think you could write one paragraph? Okay, then, do you think you could write one page? No? Then just write one paragraph a day. That’ll get you there, too. Eventually, those paragraphs will become a book. Little by little, one twig at a time, the bird makes its nest. Don’t set out to conquer the whole world – just your little corner of it. I hope your new year – whenever you started it (or plan to) – gets you where you want to go! 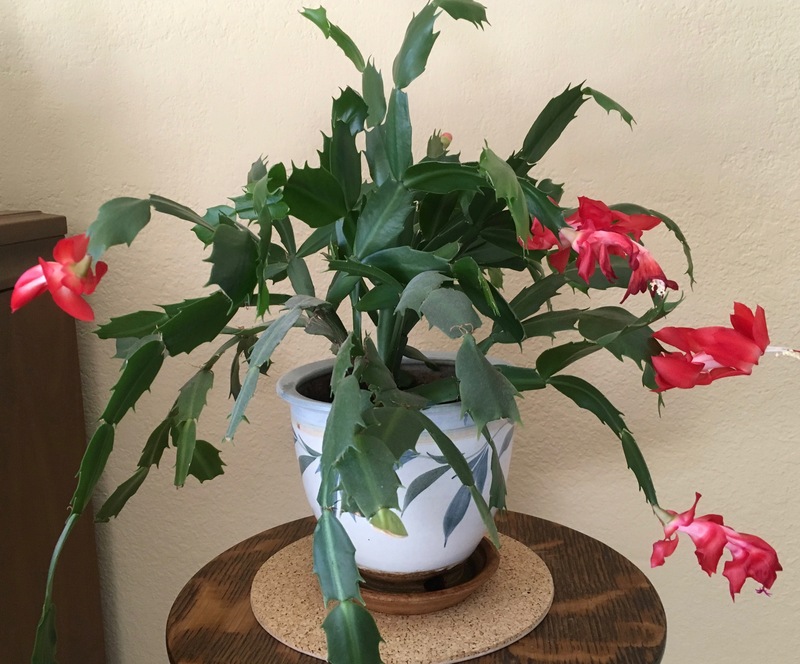 Did you recognize my Christmas cactus at the top? And here’s a little winter beauty to inspire your winter goals. 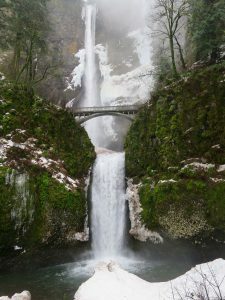 This is Multnomah Falls, in Oregon. Well said young lady. And I couldn’t agree more, if you can’t say a whole just say one syllable. I believe it was in Finding Dory where they said “just keep swimming…” but that movie is about a fish. As always its a pleasure reading your scribblings, your not just articulate, you’ve got a splash of poet in you too. keep writing please. A ‘splash of poet,’ eh? Stay tuned…a blog on poetry coming up soon…. Awesome to see you back blogging D! I could not agree more, every day is a fresh opportunity to start anew. Those who wait for Jan 1 are only kidding themselves. Carpe diem! I look forward to reading your new blogs and gaining insight into your perspective on life. You are exactly right and your blog post was a good reminder of the importance to set and work towards our goals. Tomorrow is not guaranteed. I remember when I climbed my first big mountain (Rainer) and when I arrived to the base of the climb I was intimidated and immediately began doubting myself. I decided at that moment to just take it one step at a time…and those steps got me to the summit! When goals seem too big, taking it one small step at a time will often get us there.